He said that under the Islamic State’s direction the Muslim world would be returned to “dignity, might, rights and leadership”. “I am the wali (leader) who presides over you, though I am not the best of you, so if you see that I am right, assist me,” he added. 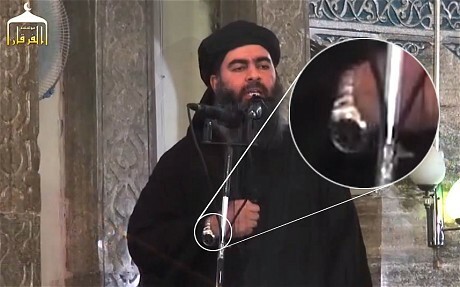 Video footage of Baghdadi’s appearance, the veracity of which is disputed by the Iraqi government, was posted on Youtube and prompted an outpouring of confused comments on social media. Another key point to make re Baggdadi appearance is the way he's dressed is supposed to look like Abbaside caliphs. Connotations obvious. @hxhassan He looked more of an #Orthodox Priest than an Abbaside #Caliph, with a righthand watch probably branded #ISIS. He is a fake actor.